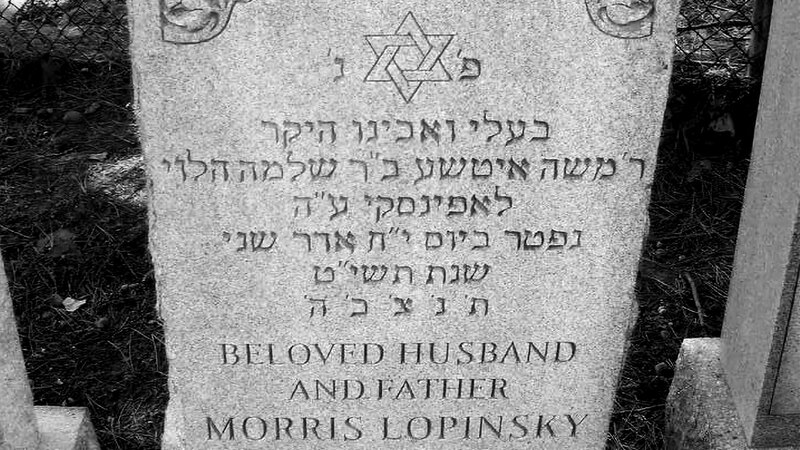 Jewish headstones in cemeteries can provide a large number of clues for researchers of family history and genealogy. Over the years, trips to cemeteries in New York have helped me solve family puzzles, while they’ve also often presented more questions and inspirations for further research. A little knowledge of Hebrew and Yiddish has made this research a little easier for me, as I need to go back only a few generations to reach ancestors who did not speak English. But linguistic knowledge often isn’t enough to decipher the information on headstones. There is a fair amount of symbolism that requires interpretation, including engraved designs as well as abbreviations. I’ve assembled a nearly-complete guide to the symbols, abbreviations, and words found on Jewish headstones, as well as some information about numbers and codes. Hebrew and Yiddish symbols and abbreviations you might encounter on Jewish headstones. Abbreviations will have the caret mark or two hash marks between letters, usually before the last letter in an abbreviation. ת׳ נ׳ צ׳ ב׳ ה׳ Abbreviation for “May his (or her) soul be bound up in the bond of eternal life,” from the first book of Samuel. ז״ל Abbreviation for “of blessed memory.” The Hebrew is זיכרונו לברכה for a man and זיכרונה לברכה for a woman. ע״ה Abbreviation for “may he (or she) rest in peace. The Hebrew is עליו השלום for a man and עליה השלום for a woman. The six pointed star (Shield of David or מגן דוד) is the most recognizable symbol of the Jewish religion. It’s more of a modern custom for this symbol to appear on the headstones of Jewish men. The menorah is the symbol of Judaism and represents the candelabra that was housed in the Temple in Jerusalem. The symbol represents pious or religious Jewish women. The hands represent the caste of the Kohanim, descendants of the high priests of the Temple in Jerusalem. The Kohanim are identified through the father’s lineage, and the hands represent the Kohanim gesture for the priestly blessing. Actor Leonard Nimoy used this as inspiration for his salute as Mr. Spock on Star Trek. Below the Kohanim in the priestly order were Levi’im or Levites. The water pitcher is their symbol because one of their functions was to wash the hands of the Kohanim. The compass and square with a “G” in the center is a symbol of Freemasonry. This could mean that the deceased was a member of a Masonic lodge. Does the G mean God, Grand Architect, or Geometry? You decide. More common symbols on Jewish headstones. In the bible, many prominent individuals were named after animals. The practice returned with Jews in Europe, where Yiddish words for animals were used alongside Hebrew. With names referring to animals, there is a strong opportunity for artistic interpretation in engraving. Common symbols include more than animals, though. Lion The lion is the symbol of the descendants of Judah. A lion might appear on the headstone of someone named Judah, Lieb, Levi, Aryeh (Herbew meaning “lion”), Loew, or Loeb. Deer It is generally thought that the name Tzvi in the bible referred to deer. The Yiddish word for deer is Hersh, so that became a popular name in the last couple of centuries. You might find the image of a deer engraved on a tombstone for someone with the name Tzvi and/or Hersh (or Hirsch). Bear The name Dov Ber — a common combination name, with Dov being Hebrew and Ber being Yiddish — is symbolized by the Bear. Wolf The wolf was the symbol of the house of Benjamin, but the symbol also represents the common Jewish names of Zev (Ze’ev) in Hebrew and Wolf (Vulf) in Yiddish and other languages. Birds Birds could have several meanings. The names Zipporah (Hebrew) and Fayge or Feige (Yiddish) are represented by birds, but birds have also indicated the freedom of souls upon death. Broken tree branch or stump These concepts symbolize the idea of a life cut short. When the deceased was a child or a young person at the time of death, you might find this symbol on the headstone. Books If you see books engraved on a headstone, you might assume the deceased was a student of the Bible. If there are five books, the deceased would have been learned in the Torah, the five books of Moses. Charity box Charitable living is an important tenet of Judaism, so families may wish to honor a deceased’s charitable nature. The symbol of a hand in a charity box may indicate that the deceased was a philanthropist or otherwise prioritized giving. Common Hebrew words on Jewish headstones. 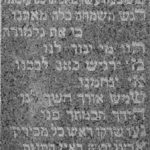 Understanding dates on Jewish headstones. The letters of the Hebrew alphabet are used to represent days of the month and the year, and the name of the month on the Jewish calendar is often spelled out. Here’s the Hebrew alphabet with each letter’s numerical value, the gematria. Letters can be combined to form numbers. For example, י״ב would represent 12 because י is 10 and ב is 2. Years in the Jewish calendar are similarly represented by letters. The example below shows how that is calculated. These are the months in the Jewish calendar. Here’s how you would “decode” a date and the rest of the information on a Jewish headstone. The third line is the date. First, נפ׳ is the abbreviation for “died,” so we know we’re coming upon a date. Next is the day of the month, כ׳ג, which represents the 23rd. Next is the name of the month, חשון (Kheshvan). The next “word” is the year in Hebrew letters, תש׳ח. Add up the values of those three letters, 400 + 300 + 8, or 708. Add 5,000, because it’s shorthand to drop the first digit in dates. It helps save space. So the date in the Jewish calendar is 23 Kheshvan 5708. Sometimes, instead of a date of א׳ or the first of the month, the inscription will say ראש חדש — head of the month. The inscription may also reference holidays instead of the specific date. 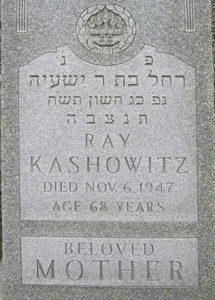 Acrostics are fairly common on Jewish headstones. Here’s an example from my own family. The first letter of each line (after “Here lies”) spells out the full name of my 2nd great grandmother, Rebecca Kashowitz Nachamin (Neckameyer): רבקה בת אברהם משה נאכאמין. Although I’m still hoping for a translation, I understand the inscription is a poem. 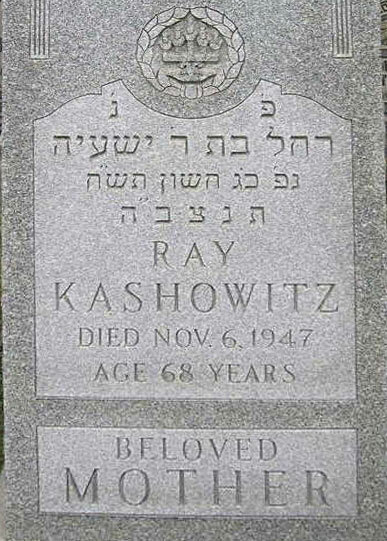 Interesting reading for further knowledge about Jewish headstones, tombstones, and epitaphs. Thank you Harlan – this is wonderful. Is there a way I can share this so more people can see it? Just to general Facebook or are there better, more focused communities? Your work on this is amazing, extraordinary. Thank you so much, it’s so appreciated and I love it. There are lots of genealogy groups on Facebook, but you could share this anywhere you share articles!